With playoff contention out of reach, many teams fans have turned into Tank Nations in which they cheer for their team to lose in order for them to get a better draft pick. Greatest Tank Battles will look at these teams and their tanking data to see where they might finish this year. Another season is in the books for the Maple Leafs as they were officially eliminated from playoff contention for the 7th consecutive year which means another year of "What's Happened Since The Leafs Last Made The Playoffs" and "How To Fix The Leafs" posts from just about everyone. Well a good start would be to secure a top draft pick this year and at the rate they're going they have a chance to make that happen. After coming out of the gate strong and even climbing to the top of the NHL standings in early November, the Leafs tailspinned out of control in February on a disastrous 5-16-3 stretch that sent them all the way to 14th in the Eastern Conference Standings. While things in Leafland are not the best right now, if they continue their poor play, they could make a big step in the right direction come draft time in June. The Leafs best armour against tanking is the fact that they have the ability to play some of their best hockey in games that have no effect on playoffs, but will impact their draft positioning (remember those Martin Gerber days?). Sometimes one of their goalies will steal a game, sometimes they play a complete overall game and resemble a playoff team, and sometimes Phil Kessel catches fire. It's uncertain who will start games for the Leafs down the stretch with Reimer out and Gustavsson letting in weak-angle goals, but if its Rynnas or Scrivens they might stand on their heads as they audition for a role on the team next season. If the Leafs consistently finish checks, play their positions and put pucks on net, they'll have a chance to win, but now that they're officially eliminated, you never know how the team will respond in the effort department. One of the things that has helped the Leafs is when Phil Kessel is clicking. He seems unstoppable with his speed and always dangerous with his shot. 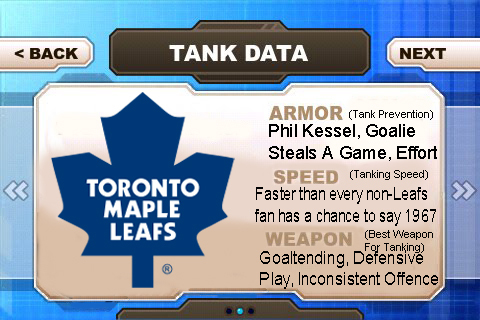 If Phil wants to Thrill, the tank hopes of Leafs Nation could be in jeopardy. The Leafs have had one of the biggest falls down the standings this season, and it's all happened very quickly following the All-Star Break. With games against Philadelphia, a back-to-back with Buffalo, Tampa Bay and a season finale in Montreal, there is a real possibility they will finish the season 0-5 in that stretch. Philly is battling for home ice advantage, and Buffalo is fighting for a playoff spot. Two skilled, desperate teams against the Leafs and you gotta figure 3 losses. Tampa Bay always offers a challenge with Steven Stamkos looking at the Leafs like wounded prey as he sets his sights on a career-high goals benchmark and a potential 60-goal season. The Lottery position could come down to the Montreal game, but with the way the Leafs are playing these days, it's looking like the Leafs will have already secured a chance at getting the #1 pick from the Lottery on April 10th. Where to start... Their goaltending is brutal, their defence suspect, and their offence has consistently been inconsistent. Jonas Gustavsson is the king of letting in soft goals and James Reimer is the king of letting in early first-shot-on-net-goals. The tandem has not worked well this year, and while they've had their stretches of playing well, when they're bad, they're really bad. It's not all their fault though, John-Michael Liles and Mike Komisarek are both -13's on the season, while Dion Phaneuf and Jake Gardiner are both in the top 10 for defensive giveaways. Watching a Leaf game is painful, but it's even more painful watching them play in their own end with a struggling d-core. Then with the offence, they go from putting 3 shots on net in a period to scoring 3, so you never know what you're going to get. With Joffrey Lupul on the shelf, the losses were almost expected and many Leafs fans threw in the towel when it was announced his shoulder was separated in a loss to Boston in the midst of their losing stretch. All these factors should solidify the Leafs a spot in the bottom five and Leafs fans something to cheer for come draft day. In the Greatest Tank Battles, the Leafs have won key battles by losing to the Islanders and Hurricanes, but they're greatest victory awaits on the last day of the NHL season in a potential key matchup against the Montreal Canadiens. A loss there could double the Leafs chances of winning the #1 overall pick at the Draft Lottery and drafting in that position for the first time since 1985 when they took Wendel Clark. Hate seeing the boys lose so badly. But glad the Leafs should finish in the bottom 5 and have a chance at least for the 1st overall pick.